We have proposed a scheme that extends the application of GAs to domains that require detection of robust solutions. We called this technique GAs/RS3 — GAs with a robust solution searching scheme. In the GAs/RS3, a perturbation is added to the phenotypic feature once for evaluation of an individual, thereby reducing the chance of selecting sharp peaks. We refer to this method as a single-evaluation model (SEM). 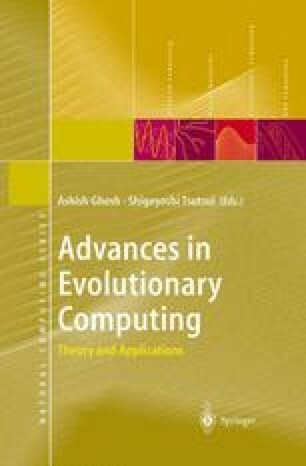 In this chapter, we introduce a natural variant of this method, a multi-evaluation-model (MEM), where perturbations are given more than once for evaluation of the individual, and we offer comparative studies on their convergence property. The results showed that for the GAs/RS with SEM the population converges to robust solutions faster than with the MEM, and as the number of evaluations increases, the convergence speed decreases. We may conclude that the GAs/RS3 with the SEM is more efficient than with the MEM. We also introduced a variation of the MEM, i.e., multievaluation model keeping the worst value (MEM-W), and provided a mathematical analysis.